I’m not sure about you, but I could always do with more money for PPC. It’s not that I’m greedy and like to spend money just for the sake of it. Sometimes there’s only so much consolidation, tweaking and efficiency you can achieve within a given limit. I’ve found that one good way to try and secure additional funding (and generally, it’s a good health check to do anyway) is to spend time looking at gaps; in particular gaps in spending and gaps in performance as a result. In essence, it’s a way to let people who hold the purse strings know what they are missing out on as a result of not spending x amount. 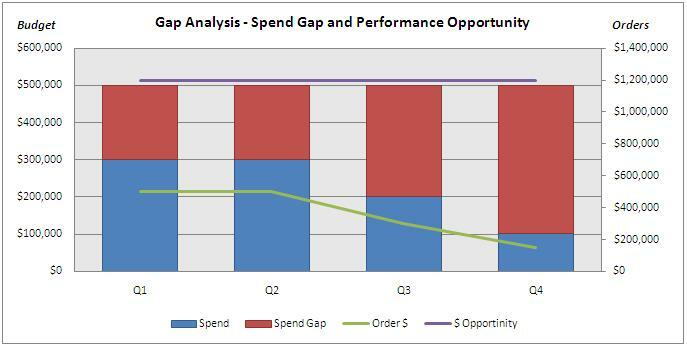 With Gap Analysis you identify your total spend opportunity and total performance opportunity and plot this against your current spend and current performance. By doing this you can start to easily compare the gaps between the two – current and ideal. Depending on how deep your analysis goes this can involve quite a bit of data, so the key is to try and present it as simply (ie: visual) as possible. The big guys like to see the big picture; they don’t like to get too bogged down with the detail, so this part of the analysis is for them. In essence it’s the executive summary that shows them in one glance how much we are spending and what we are getting, compared to how much we could spend and how much we could get as a result. Use a set period (be it a year, half year, quarter etc.) and record your current spend, spend gap, and total potential spend; then on a second axis do the same for a chosen performance indicator – for example, it could be number of clicks, number of key website engagements, number of leads, sales order dollars etc. The closer you get towards calculating actual $ as a result of performance, the more attention you are likely to get. Then plot this data out in a chart. I’ve found that using stacked columns (for spend) plotted against stacked lines (for performance) helps to illustrates the gaps well. Here’s an example below. Although the numbers I’ve used here are made up, it illustrates quite clearly the gaps in spend vs. performance, as well as the consequences of a budget reduction. Once you have your high level gap analysis you can start slicing and dicing data at a deeper level (for example by region, country, product group, customer segments etc) to help inform you where the best opportunities lie. I’ve found it’s most useful to slice the data according to how your company is organized as it helps to target the data to potential sponsors. So for example, if internal funding opportunities come from a product line group, then slice the gap analysis by product line. Even if there isn’t any immediate funding available, it’s good information to have to hand when budget does happen to appear, and even if you don’t get the whole “ideal” amount (the chances of which are slim at best), it provides a good talking point to negotiating a contribution towards minimizing the gaps.